Me and Rory tried some Rally the other day. We are already taking agility lessons, but more of that to come… Rally is different. Rally-o is a mix of agility and obedience. You move around a course following the instructions on cones until you finally pass through the finish. If you do an action wrong, then you get penalty points. I think you also get penalty points if you run over the ideal course time. Lowest score in the quickest time wins. You get the idea. Now for some reason that is beyond me, there are two different ways of doing Rally, Talking Dogs and APDT. I don’t know why this surprises me… there are also two ways to do agility (Kennel Club and UKA). The two types of Rally signs are similar, sort of mean the same thing, and have a different amount of sits. (Bear with me, I only did a one day Rally workshop). The benefit of the Wagtails Canine College workshop that I attended, is that they introduce you to both types from the beginning. Personally, although this was a bit confusing at the start of the day, I think that it is better to learn the differences and the different signs from the very beginning so they become almost instinctive. Anyway, enough about the confusing technicalities. How did we do? Well after the initial shock for Rory that he was not allowed to charge everywhere (like I said we are agility nuts at the moment) he got everything, pretty much first time. My dog is a genius: this was to be expected. Now, I, on the other hand, struggled. The signs were all new and so confused me. I gave Rory commands late, which resulted in him reacting too late. I was taking photos, which slowed us even more! In summary, Rory was brilliant, I was rubbish. Having said that, by the end of the day, with lots of instructor support, we were definitely getting there! At the moment I crave the excitement (and the physical energy burning for Rory) that agility brings us. I can’t afford to do both at the same time so Rally will be taking a back burner for me, for the immediate future anyway. I would recommend it for those with dogs that like to think, and I can see major benefits for older dogs whose limbs won’t be up to the strains of agility. And if you want to compete, and do well, but your dog is not built for speed then Rally is more for you. How many of us are going to beat a Collie in a flat-out race? As I write this, I can see @HaslemerePetCo and @HaslemerePets‘s Patch in my mind. (See picture above.) He loves Rally. His tail wags the whole way round. He is brilliant at it. And he is proof that everyone should give it a go. No-one could resist the chance to make their dog that happy! I have just discovered Rally thanks to Haslemere pets! 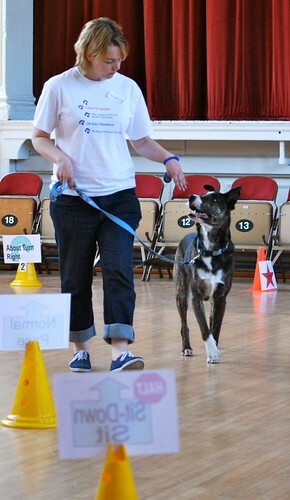 We had a very brief try at our local dog club a couple of weeks ago. It suits my Digby Dog down to the ground so looking for a proper club to join now.